At the end of September Packt Publishing celebrated the publishing of their 1000th book by offering a free book to all their registered users. 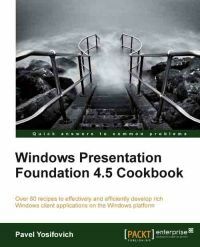 After I decided for Windows Presentation Foundation 4.5 Cookbook by Pavel Yosifovich they approached me if I could write a review for the book once I read it. It took longer than expected but I'm finally done with it and ready to share my impressions. Taking a look at the table of contents is enough to realize that the author took on a task of covering a very broad range of topics. What could easily be a daunting set of disconnected code recipes, actually turned out to be a well structured and thoroughly explained overview of WPF. Although the cookbook approach makes it easy to read only individual recipes of interest, I can strongly recommend to take the time and read the complete book. There are many small nuggets of knowledge given throughout it which are not directly related to the current recipe and you are bound to miss them otherwise. I was also pleasantly surprised by the fact that the code snippets are accompanied by in depth explanations of related topics. They often even include alternative approaches to solving the same problem with pros and cons for each one of them. Due to the nature of WPF with many ways of achieving the same I find this very valuable. Since the book has only been written recently, it can take advantage of all the practices and experiences that have accumulated since the original release of WPF. As a bonus it doesn't forget about the new features included in .NET framework 4.5 and C# 5. On the other hand the book is not all that friendly to novices and you really need to have some previous experience with WPF before you start reading it. The wording is often very concise and in my opinion it could be challenging to get into without understanding at least the basics. Because of that I found it really strange that a couple of times the author starts explaining how to use certain Visual Studio features, such as code snippets and smart tags. I don't think this is really necessary for the intended audience. All in all I still like the book very much. In spite of all my previous experience with WPF, I've learned a couple of new tricks while reading it. I'm sure I'll be returning to it from time to time to read up on certain details. I also feel the need to mention that I've encountered a couple of typos and even other minor mistakes in code and screenshots. They never really bothered me, but your mileage may vary.